Category Archive for "EveryMind News" | EveryMind | Your Mental Wellness. Our Mission. Posted on May 23, 2018 at 3:19 pm. 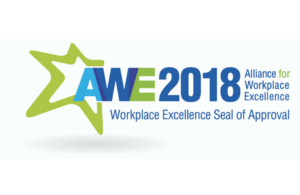 The Alliance for Workplace Excellence (AWE) is awarding employers for their exemplary commitment to building excellent places to work in Montgomery County, MD and throughout the United States. Founded by Montgomery County and Discovery Communications, AWE is dedicated to increasing the number of excellent workplaces through education and recognition, as a means to enhance the quality of life for its citizens and empower economic growth. EveryMind offers generous benefits and a mission focused culture that creates an environment where employees are engaged and active in the mission to Strengthen Communities and Empower Individuals to Reach Optimal Mental Wellness. EveryMind recognizes the value of resources for self-care, providing all employees and their family members with eight mental health sessions per calendar year through our comprehensive Employee Assistance Program. EveryMind is honored to receive the Workplace Excellence Seal of Approval for the 14th time! Our employee programs recognize the importance of spending time with loved ones, which is why our employees are offered more than 20 holidays including summer and winter mental health days and a day off to volunteer for a charity of their choice, in addition to standard vacation and sick leave. By providing our staff with a supportive and caring work environment, we can help prevent burnout and increase productivity. On June 8th, EveryMind will be honored alongside 45 other award winning companies from across the United States. Among the various awards, the Workplace Excellence Seal of Approval will be given to 41 companies, including EveryMind. The celebration will focus on “Witty, Gritty, and Wise: The Power of Cultivating Leaders at Every Level,” including educational sessions for attendees and a keynote speech by Robin Koval, CEO & President of Truth Initiative and co-author of Grit to Great.